Reduce stress & boredom while you work. Image Carousel Screen Saver displays over 40 full motion video clips and 80 still images with sound. Personal Desktop attaches over 80 audio clips to Windows functions. Jixxa Creates easy, medium or hard puzzles from 20 different images. 25 Full screen wallpaper images. Serial Numbered limited edition of only 250,000 units. 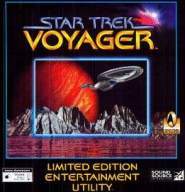 It contains a collection of screen savers, audio clips, images and animations to personalize your Windows (3.1 or 95), all taken from episodes of Star Trek Voyager. You can combine with each event to a Windows audio clips containing a sound effect or a phrase by Captain Janeway, Tom Paris or the holographic doctor ("I'm a doctor, not a performer! "), automatically have a different background every time you start Windows or have fun doing one of 20 puzzles that will be installed on your hard drive. Varied and interesting as screen savers, including cards of the episodes, archive staff and some interesting animation, is obviously the telefilms. Note that the sound effects are stereo for sound cards that support the Q sound. The package is distributed limited edition and contains even the certificate of authenticity. Very nice the packaging that has a picture on the front (which can be removed) containing the holographic image of the USS Voyager that moves according to the orientation that you give to the box.